T loves to paint, I've already got a large crate full of paintings and pictures that I'm not throwing out!!!! He does lots of painting and art at nursery so that comes home too. I'm trying to be creative with our art sessions so that our painting goes beyond just painting on paper. 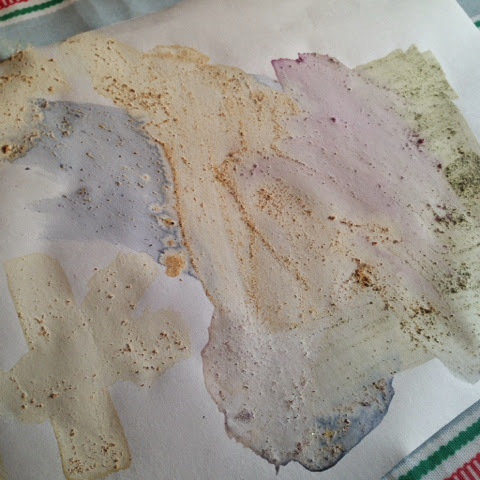 This activity spanned a few days which I really like, resulting in a beautiful picture using flower petal paints which look like watercolours, I can also see that we can do this again when he's older when hopefully his concentration will last a bit longer and he'll be able to get more involved in actually making the paint. First we (well I, T got bored!) collected flower petals from flowers in the garden, I chose nice fresh petals and a few nice green leaves. 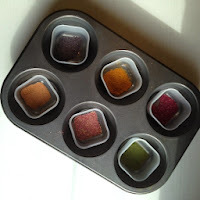 We collected in a muffin tin because I wanted to pop them in the oven later on. We left the petals overnight so that any bugs had an opportunity to escape. Before popping these in the oven to dry I checked through them again for bugs! 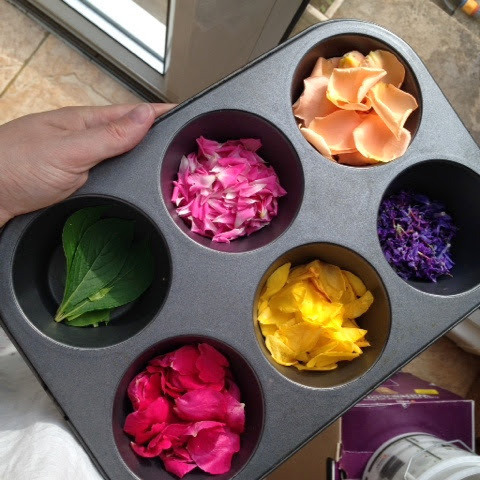 The next day I put the petals in the oven (whilst cooking dinner!) at 180oC for 15 mins, I think the time will depend on your oven and how 'juicy' your petals are! Once I'd switched off the oven I popped the petals back in the cooling oven so I guess they got about 30 mins heat here too. This dehydrated our petals brilliantly. Big apology at this point, like a right plonker I forgot to take a photo of the dehydrated petals (very cross with myself!) think of pot pouri you are not far off though! You can also get a bit of an idea from the photo below. 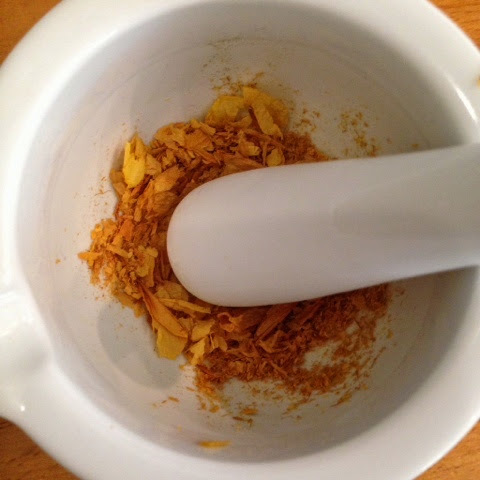 I used a pestle and mortar to turn the petals into a fine powder, I tried to get T involved but he wasn't really that interested. Some petals were easier to crush than others so I ran those that were still lumpy through the little food processor using the pulse button, T was very happy to use that! Once finished our petal powder looked like this. The yellow flowers and green leaves were the best. 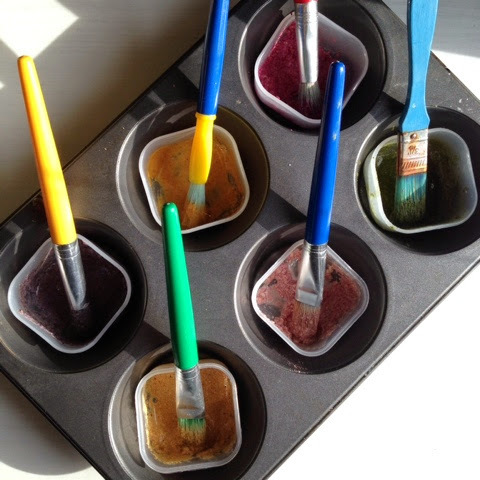 To make the powder into paint, I added 1/2 tsp cornflower and water to make a paint consistency to each pot. The paint was a little lumpy, maybe I didn't make it fine enough, or dry the petals enough but T was more than happy and liked painting with something different. We talked about the flowers we used and that some were from his Grandad Bramham's memorial rose bushes, the colours held quite well and resulted in a watercolour type effect which is very different from the vibrant colours we usually use. From our experience, roses weren't too successful, they were the petals which wouldn't breakdown into a fine powder, maybe running them through a sieve would be better in hindsight. The roses were pink, red & orange. The leaves were really successful, as were the yellow flowers (sorry I don't know what they are called!) the purple were buddleja which came out a lovely dark purple but the paint faded really quickly in the pot. 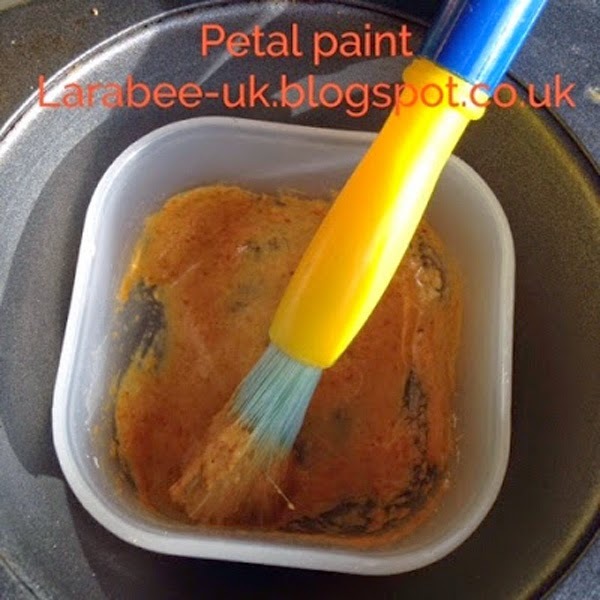 If you have lots of flowers in your garden you could give this a go, or alternatively go for a walk and pick some wild flowers or weeds, I'm sure dandelions would make a great yellow petal paint! Please do tag me or comment if you try this, I'd love to see how different flowers make different paints. this is a great idea! Just got to wait for the snow to stop here! Can't believe it is almost May!